I may be nuts. Here I am starting a new sister blog to IQs Corner devoted to the narrow topic of the psychology of time, particularly brain-based research and theory regarding internal mental/interval time keeping and the idea of a master internal master brain-based clock. Why? Because, as I've mentioned on IQs Corner on-and-off the past few years, I've become very interested with the growing research that suggests that the brain may have a master internal clock that governs interval timing and, more importantly, this internal master clock may be one of the major "essences" of complex human cognition (e.g., g or general intelligence). So, at the urging of a few folks, I've set out to attempt to maintain a blog where contemporary research and theory in this field is provided to interested readers. 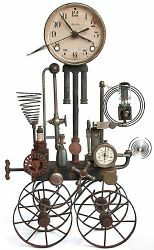 I have no shortage of material that I've accumulated over the past three years....the big problem will be to carve out the necessary "time" to feed this new blog....Tick, Tock, Talk: The IQ Brain Clock. Be patient as I get the mechanics of the blog (hit counter; technorati pings etc.) up-and-running and attempt to provide some degree of consistent material. Let the games begin! Start your clocks. All the time-ticking best with your blog! May your fingers do the talking on the keys where you not aloud to.....make typos. Welcome...again. Looking forward to reading your articles. 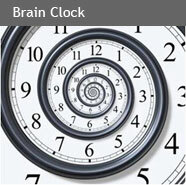 Why the IQ Brain Clock Blog? Subscribe to Brain Clock "Times"
Brain rhythm treatment efficacy: Can we fine tune our brain clocks? How many clocks do we have? Time keeper brain location-fewer areas? Brain fitness program benefits elderly? Book review of Jensen's "Clocking the Mind"
Is ADHD related to a poor internal mental clock?